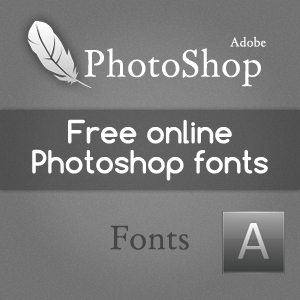 This article contains references to various sites for downloading and installing custom Photoshop fonts. Although Photoshop users mainly use the software to edit snaps, Photoshop can be effectively used to create design templates for Web Development and also posters for promotion and stuff. Now, creating a template or a poster means that there has to be some amount of descriptive writing inside it. The spatial presentation of the writing and its customization indicate the level of importance of the text. Hence, we feel the need to use different fonts for the text. Let us look at some of the sites from where Photoshop fonts can be downloaded. All of these sites provide fonts for FREE, but some fonts might be restricted for personal use only, while others might be free for commercial as well as personal usage. Be sure to check the license before you decide to use them for your commercial projects. Urbanfonts is one of the newer sties that has come up in this field. The cool thing about this site is that the Mouseover event over a particular Photoshop font generates an instantaneous display of the name of the font in its own style. Aside from this,the Custom Preview option is also available here. dafont.com was actually suggested to me by a friend of mine a few days back.The site is actually quite good.It provides a very good user interface and a clean mode of categorization. Selection of a particular Photoshop font results in the page reloading and displaying the font’s entire character set. The only downside is that no Custom Preview option is available. After selection, you will find a Download button on the right hand side of the selected font. Click on that button and choose your desired destination folder to start the download. Open the destination folder and find the TrueType Font file(the file which has a .ttf extension). Open the file and click on the Install button on the upper left hand corner of the window next to the Print button. Open Photoshop and you will find the font in the Font dropdown menu. So, that’s all about Photoshop fonts. Hope this post has been useful.